We left Stratford-upon-Avon and headed to Bath, another historical city. On the way we noticed an English Heritage sign touting the Roman Cirencester Amphitheatre. Thinking it’d be worthwhile to stop, we did, but not before driving right past the poorly-marked location. However, it was worth the hunt just to chuckle at the site’s opening hours. By the way the only remnants were literally the earthwork. So, back in the car towards our original destination. Locating a parking spot in this crowded city was quite a feat, but find one we did and began our brief tour of Bath. and the Christmas shoppers (jam packed through the holiday stalls). Soon the Abbey opened its doors and in we went. Like many of these church buildings the present Bath Abbey (dating from 1499) actually stands on a former religious site, a Norman cathedral. A plaque lists not only the Christian leaders from the 11th century but also those from as early as the 7th century when abbesses led the local community. 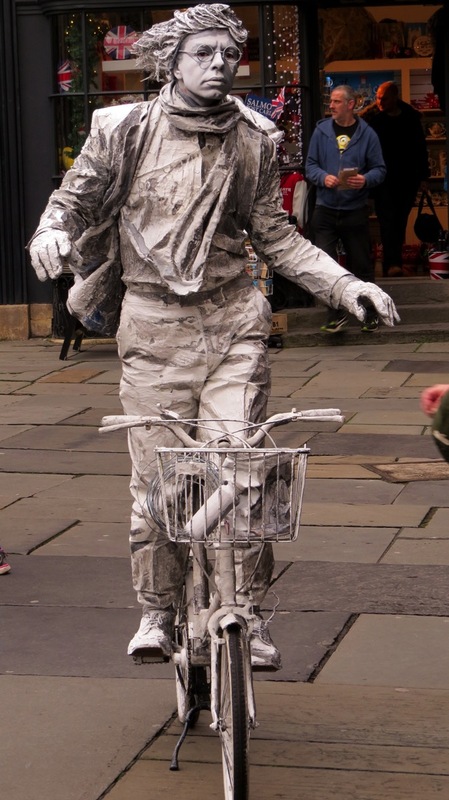 Must say of all of our Bath touring the most fascinating was a busker posing as a silver-clad, wind-blown cyclist. Returning to the car we saw a notice stuck on the windshield. Sure enough, the parking space we gleefully squeezed into was evidently not a valid one. We had checked the other cars to see if any paid & displayed parking stickers (no); checked any parking signage (yes, touting no fees for Sundays). Evidently we don’t know what to look for because, in spite of our scouting out parking requirements, we still got a ticket. Anyhow, Max as a Bath (Maine) native son has emailed Bath (UK) parking powers-that-be to plead our foreign innocence. We’ll see what comes of it as we were able to get another ticket earlier this year revoked. Then we were off further south to Salisbury where we landed, once again, in a parking lot scrounging for a spot only to discover it was for day trippers only (no overnighters, which is what we needed). Great. This time, however, parking gods bestowed upon us a gracious and kind shop owner. He must have noticed our frantic ‘what-now? !’ looks when he said the lot was truly only for day trippers for he then told us to use his personal space behind his shop (he was leaving for the night and would return at 9a the next morning). A true gift. We lugged our backpacks to our hotel and settled in. Knowing it’d be a good time to view Stonehenge due to fewer visitors at this time of year we hopped in the car for the thirty-minute drive north. The first mention of Stonehenge or “Stanenges” was in a 1130 C.E. archaeological study by Henry of Huntingdon. By 1610 “Stanenges” morphed into its current name “Stonehenge”. By the beginning of the 20th century more than ten excavations had occurred. Fortunately, an effort was made to ensure the protection of this historical site with the lobbying of the site’s owner, Sir Edmond Antrobus, by the Society of Antiquaries. With funds for preservation, this landmark was ensured longevity; and, a new visitor center opened in 2013 hosted us as we wandered through the various exhibits. There’s a jitney taking visitors to the actual stones 1.5 miles away; so, we hopped aboard for the short jaunt. We probably should have gone the full ride so we’d be the first of only four tourists at the site; but, we opted to walk the last half of the trip. However, the bonus of walking (through what turned out to be a cow field) was our gaining a broader view of the area’s offerings via a large plaque. Neither Max nor I realized the existence of extensive earth and stone structures built in addition to Stonehenge. During the Mesolithic period (8,500 to 7,000 B.C.E.) pine poles had been erected in the area, possibly used as totem-poles. These holes are called Aubrey holes after the 17th century antiquarian who found them. During the Neolithic or New Stone Age (4,000 – 2,300 B.C.E.) and Bronze Age (2,300-800 B.C.E.) people used this location for both burials and pilgrimages, with Stonehenge being the most prominent. Archaeologists defined the constructions as cursus (rectangular enclosures with an external bank and internal ditches) and barrows (earth-covered burial mounds). I won’t go into the definition of henge except to say, when applied to this monument, it means hanging – as in suspended – thus ‘hanging stones’ or Stonehenge. Their chosen location, now called Salisbury Plain, would have provided a prominent view of any monuments due to the wide open space. You can see the red dot positioning us on the map below. We walked through the cow field that contained some of the Bronze Age burial sites called the Cursus barrows. The first and last time I had visited this iconic formation was in 1971. This 4,500-year-old site happened to be part of an American Youth Hostel biking tour, which a high school friend, Annie Bommer, and I joined (it was during that trip I envied dogs whose heads stuck outside their owner’s four-wheel vehicles as they whizzed by our two-wheel mounts). Forty-five years ago one could picnic on the stones, which we did along with tossing frisbees about. No more. After reading about the limited access I feared we’d be peering at these monolithic stones from way far away; but, happily we could get to within 100 feet or so. And, due to being winter, we were some of the first and few people there compared to summer traffic when as many as 5,000 visitors daily tour this site. During its use as a monument, Stonehenge went through various reshufflings of two types of stones: smaller blue stones from the Welsh Preseli Mountains (150 m. NW) weighing about five tons each; and, larger sarsen stones (local sandstone blocks, 20 miles north) weighing over 27 tons each. What we currently see is the last of three stages of stone formations at the site. A 1.7-mile road called Stonehenge Avenue connected Stonehenge to the River Avon. Although we didn’t walk it we saw faint outlines of it once we arrived at the stones themselves. With only a week to go until December 21, winter solstice, we checked out the markers supposedly used for celebrating the lengthening days. By the time we had finished touring the site and the center the sky was beginning to spit rain, so we scurried back to the car for a picnic lunch prior to returning to Salisbury. Whatever the purpose of these megaliths, staring at those huge stones sitting in the middle of a hilly, windswept plain is pretty awe-inspiring. 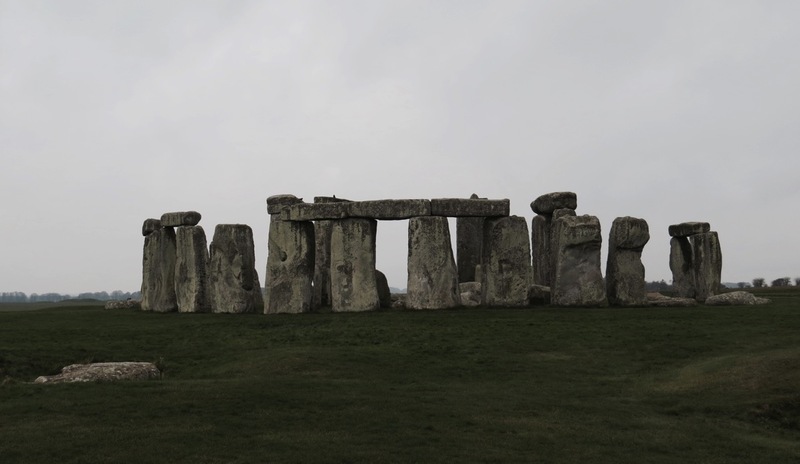 As a darkening, overcast sky began sweeping across the plain, I recalled again my visit 45 years earlier in the sun and warmth and realized how today’s weather felt more like the true dressing for these majestic stones. 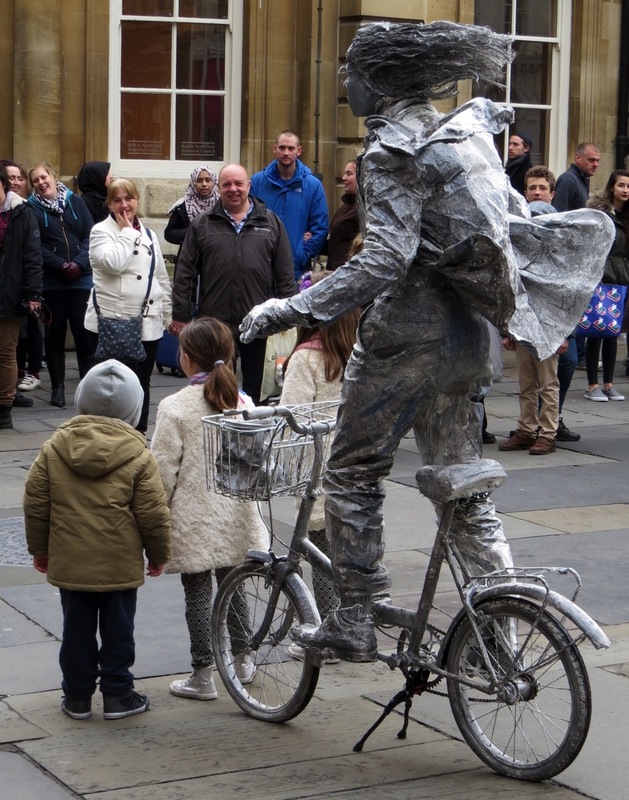 This entry was posted in 2015 04 UK - East Coast & Central, 2015 Winter Tours, COUNTRY, England, Europe, WINTER TOURS on January 4, 2016 by margaretlynnie. I have never been to Stonehenge. Thank you for that wonderful tour and history lesson! The baths at, well Bath, have fabulous holograms of Roman bathers, togas intact. There’s truly no consensus on how they were transported but here are some theories. Your comment about the mule team is in line with one calculations saying 500 men to pull and 100 to rearrange the rollers! Happy new year to you and Marty! The second and most dramatic stage of Stonehenge started around 2150 BC. Some 82 bluestones from the Preseli mountains, in south-west Wales were transported to the site. It is thought these stones, some weighing 4 tonnes each were dragged on rollers and sledges to the headwaters on Milford Haven and then loaded onto rafts. They were carried by water along the south coast of Wales and up the rivers Avon and Frome, before being dragged overland again to near Warminster in Wiltshire. The final stage of the journey was mainly by water, down the river Wylye to Salisbury, then the Salisbury Avon to west Amesbury. The third stage of Stonehenge, about 2000 BC, saw the arrival of the Sarsen stones, which were almost certainly brought from the Marlborough Downs near Avebury, in north Wiltshire, about 25 miles north of Stonehenge. The largest of the Sarsen stones transported to Stonehenge weigh 50 tonnes and transportation by water would have been impossible, the stones could only have been moved using sledges and ropes. Modern calculations show that it would have taken 500 men using leather ropes to pull one stone, with an extra 100 men needed to lay the huge rollers in front of the sledge. The famous monolithic rocks of Stonehenge were not dragged 140 miles from Wales to Salisbury as previously thought, but were actually moved by glaciers, a team of Welsh academics have claimed. “In November 2010, the engineer and former BBC presenter Garry Lavin unveiled a new hypothesis, suggesting that the builders used basket-like wicker cages to transport Stonehenge’s massive bluestones. To demonstrate his concept, he created a prototypical cradle made from willow and alder saplings. Lavin believes that groups of four or five men used similar contraptions to roll the stones over long distances, perhaps with the help of oxen. When they reached rivers, the giant baskets became flotation devices that the movers could guide downstream. “They are not typical of the local geology- indeed, the source of the bluestones, the first stones erected, has now been traced to the Preseli Mountains of south-west Wales. Somehow these enormous stones were transported to the Salisbury Plains. The stones were surely too heavy for timber rollers. Perhaps they were transported on sledges, on greased tracks of wood, pulled by rope that had been made from the plant fibre of the indigenous lime bark soaked in water for weeks. Modern engineering simulations have surmised that the massive uprights were hauled into place then tipped, using stone counterweights, into position, demonstrating an understanding of the centre of gravity. The technology was staggering. For example, even though the ground is slightly sloping, the lintels are perfectly horizontal. The craftsmen employed carpentry techniques – the lintels were dressed with mortises that would have fitted securely on to the tenons on top of the supporting sarsens, while tongues similar to toggle joints linked each lintel in the outer circle to its neighbour. It was in effect an enormous three dimensional stone puzzle. To get the 9 ton lintels into place, the most likely method of construction may have been via the use of an earth ramp piled up against the uprights. The lintels would then have been hauled up the ramp by ropes into their exact position. Well the parking gods in Bath, UK were not in a holiday spirit, and did not waive our parking penalty.